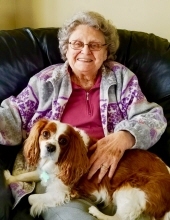 Jacqueline Joyce Defenthaler, a resident of Brighton, Michigan and former resident of Malvern, Ohio died in the loving care of her family on February 1, 2019 at the age of 86. Jacqueline was preceded in death by George William Defenthaler, her beloved husband of over 59 years (d. 2011) and their daughter, Linda Bickes (d.2015). Jacqueline is survived by her son, George (Jody) Defenthaler; her daughter, Ginger (Miguel) Fernandez; son-in-law, Bernie Bickes; grandchildren, Nick (Robin) Defenthaler and George (Lindsay) Defenthaler, Breanne Bickes, and Brian Bickes; great-grandchildren, Addyson, Mackenna, Zach, Brek and Ivy, as well as extended family and dear friends. Visitation will be held at Lynch & Sons Funeral Home, 600 E. Main Street, Brighton, on Tuesday, February 5, 2019 from 4-8 PM. Memorials may be made in her name to the Wounded Warrior Project. For further information please phone 810-229-2905. "Email Address" would like to share the life celebration of Jacqueline Joyce Defenthaler. Click on the "link" to go to share a favorite memory or leave a condolence message for the family.